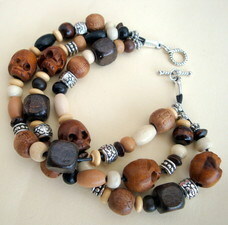 Wooden beads and skulls layered bracelet. Selection of wooden beads in shades of brown - cream, chunky wooden skull beads and Tibetan silver (metal alloy) beads on three strands of black cotton cord fastened together with a small toggle clasp. Length approximately 8 inches. A larger wrist size version is available here. Each one will be a different pattern of beads so will vary slightly from photos.